We catch up with the West Coast Avengers putting down a nutter-butter named Gridlock who's telekinetically turned a traffic jam into a giant monster. I guess kaiju-busting is this team's signature thing? There's no time to rest - or to field ominous phone calls from Captain America about cheapening the Avengers brand, yikes - before a fresh crisis rears its ugly head. According to "the mayor," trouble is brewing at an abandoned amusement park! Amusement park? Please don't be Arcade please don't be Arcade please don't be Arcade! 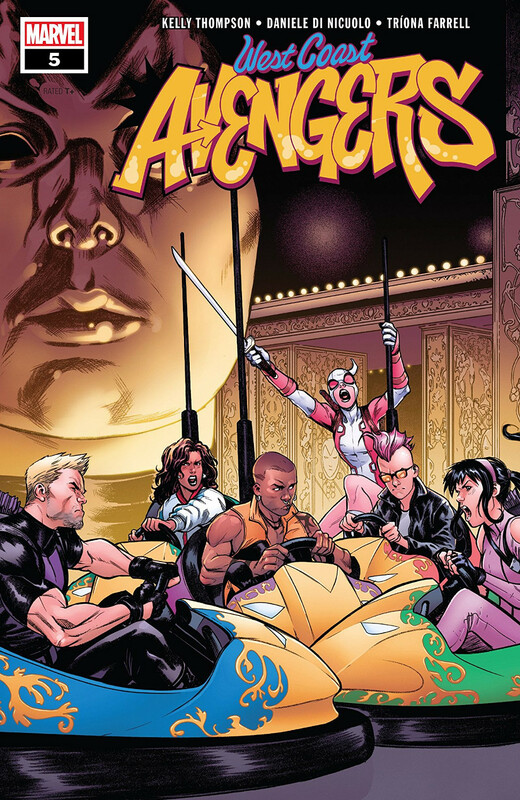 The adversary masterminding this flashing neon trap for the West Coast Avengers hasn't quite been revealed yet. There are heavy Madame Masque hints, but also some more infernal influences in play. From a script standpoint, this title is back to its starting-gate strengths: fast-paced absurdity, awesome team interactions, oodles of style, oodles of sass, and a fair compromise between advancing Kate's story and getting to know her teammates. The plot forces the team to split up - right after they talk about what a bad idea splitting up would be, love that genre awareness - and the last act introduces some wonderful sub-groupings. We get the Quentpool scene that was more or less inevitable, and it's charming and enlightening while still preserving some wonderful ambiguity about the romance and Gwen's current power situation. What's more surprising - and, to me, more satisfying - is further development of the sub-group of America Chavez and Clint Barton as the team grown-ups. They have a magical (platonic) chemistry together that I suddenly want a dozen more issues of. This new arc also gives us a new artist, and the first impression is impressive. The precise line work and character designs fit closely with what came before, but a distinctive and attractive (if more angular) style emerges over the course of the issue. Quentin Quire looks different. Good different. The colours ride through the artistic transition in fine style. This is another day-to-night story with enough different settings to visit every point on the rainbow. By the end, colours and lines are working together as a superb team - the lines carve out strong characters and actions and the colours bring it all to life with three-dimensional shading. Seriously, though, if this is Arcade, I am gonna plotz twice.